Terry Bolton nearly quit tournament fishing after 23 years without a major victory. Good thing he decided to give it a 24th shot. Buoyed by a behemoth 33-pound, 9-ounce bag on day two of the FLW Tour opener on Sam Rayburn, Bolton finally hoisted to trophy he’s long chased. He did the bulk of his damage tossing Rapala DT crankbaits — either a DT10, a DT14 or a DT16 — to grass edges despite the high water. He rigged his DTs on a Lew’s Custom Pro Ledge Casting rod, paired with a Lew’s BB1 Pro Speed Spool in 5.1:1 gear ratio spooled with either 12- or 14-pound Suffix Invisiline fluorocarbon. Being he’s often called “Blade,” Bolton also mixed in a white 3/4-ounce Accent spinnerbait, as well as a Carolina rig equipped with a 5-inch Zoom Lizard in green pumpkin. So, now that Bolton finally has that 23-year monkey off his back, where does his slot in our rankings? Considering he says 2018 was one of the worst years of his career, the steady Bolton had fallen quite a bit rankings-wise, but this victory may allow him to once again get back into double digits, as he’s now ranked 115th in the sport. While runner-up Nick LeBrun hasn’t fished enough major-level events to be ranked yet, the guy behind him sure has, as Bryan Thrift continues to build on his No. 1 ranking. He now has a 869.948 average, further separating himself (along with No. 2 Jacob Wheeler) from the rest of the field. Thrift and Scott Martin (No. 16) are the only FLW Tour anglers currently ranked in the top 60. 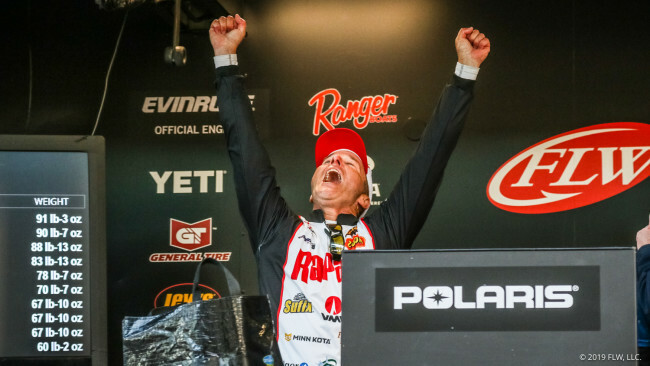 Meanwhile, David Williams had a shot to be the third-highest-ranked FLW angler, but his last-place finish at Rayburn killed his average, and he fell all the way to 105th. In other news, we’ve made a significant change to our website and rankings we’ll be unveiling soon. Hence the delay on this article. Look for more information within the next week.